A New Zealand man says he is building a cruise missile in his garage with parts bought on the internet - for less than $5,000. Internet developer Bruce Simpson, 49, says on his website that the aim of the project is make governments aware how easy it would be for terrorists to build a low-cost missile - not to provide the instructions. He also insists that the national air force would have no means of stopping such a missile. There has been no official comment so far from senior defence or police officials in New Zealand. According to the website, Mr Simpson purchased a GPS development system for the project for $120 through online auctioneers eBay. "This provided me with a GPS receiver, antenna, computer interface and the software needed to interface with a flight-control computer. "The product was delivered by international airmail in less than a week and passed through customs without any problems." Mr Simpson told Radio New Zealand the low cost cruise missile was "like a small aircraft powered by a jet engine", and that he expected to have it flying by the end of the month. Of the 15 stages of development, the initial procurement of materials is the only one completed on his website diary. He said he went ahead with the project after visitors to his site challenged his claims that it could be done. "You don't have to be a rocket scientist to build one", he was quoted as saying by the New Zealand Herald. 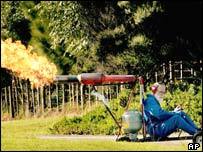 The paper also said neighbours did not appear to be aware that Mr Simpson had turned his attentions to missiles, although they did know he was testing pulse jets in his shed, north-west of Auckland. A police spokeswoman declined to comment on whether the project was being investigated, but said they were now aware of the situation. "It's not something we recommend people try at home," spokeswoman Rebecca Holt told The Associated Press news agency.